A proposal in Sacramento to change state law to monitor, regulate and track every well that uses hydraulic fracturing, or “fracking,” has moved closer to becoming state law. The Bill, titled SB4, was introduced by State Senator Fran Pavley, a Democrat from Calabasas who represents Simi Valley, Thousand Oaks, Agoura Hills and Westlake Village. Pavley’s bill has been two years in the making. The bill has already passed the state senate, the Committee on Natural Resources in the California Assembly and will now be heard in Assembly Appropriations in August. If it passes both state houses it is expected to be signed into law by Governor Jerry Brown. The move to change state law follows an exclusive investigation by NBC Bay Area back in February 2012. NBC Bay Area’s Investigative Unit uncovered the fact that, while fracking has been used by oil and gas companies in California for nearly 60 years, the technique’s use and prevalence has increased. Furthermore, it is not formally tracked or directly regulated by law. Pavley’s bill would also require that oil and gas companies give notice to landowners in areas where fracking is going on. Currently all that is done voluntarily through a website called FracFocus. And though officials with California’s Division of Oil, Gas and Geothermal Resources moved to begin regulating this practice after our investigation first aired, Senator Pavley wants to make these regulations the law, not just administrative rules. In the meantime, unregulated and unmonitored fracking goes on in places like the agricultural fields of Kern County north of Bakersfield. Some farmers are concerned about all the oil rigs and fracking operations growing in the alfalfa fields and almond orchards around them. “We’ve never had it. Now it’s right in the middle of our agricultural ground here. It’s like an invasion of Saudi Arabia,” said Tom Frantz, a fourth generation farmer living near the town of Shafter. Since the early 1900s there have been massive oil pumping operations around Bakersfield, along the Kern River in and around Bakersfield, south of where Frantz lives. But only recently has drilling really expanded into the farmlands around the town of Shafter in northwest Kern County. After decades as a high school teacher, Tom Frantz retired four years ago to the orchards where his father, grandfather and great grandfather farmed before him. He worries about all the oil rigs now growing in the fields. Where a visitor to the area once could see only miles and miles of alfalfa, almonds and pistachios, metal rigs now grow. Some reach nearly 100 feet into the air, often overshadowing the nut and fruit trees. One of the reasons for this modern day “gold rush” is the potential that lies deep beneath the fertile farmland: billions of gallons of shale oil. “There’s a lot of effort under way right now as we speak to see if it could be used to unlock this enormous resource in the Monterey Shale,” said Tupper Hull, vice president of the Western States Petroleum Association in Sacramento. According to scientists, the Monterey Shale is a 1,750-square-mile area of underground shale rock running under the Central Valley. It extends from the Bakersfield area in Kern County all the way north to Modesto and beyond. 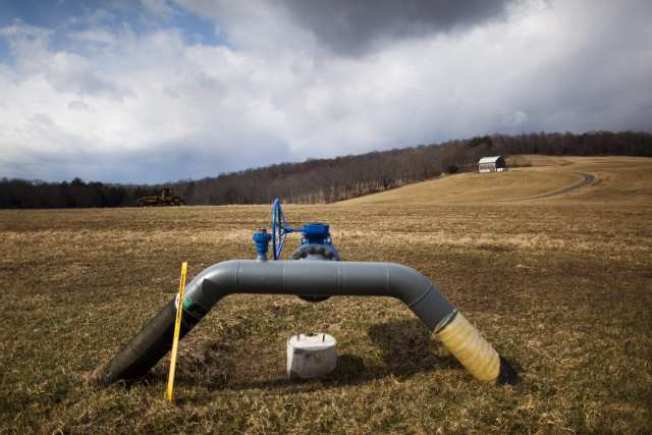 The United States Energy Department estimates the shale might contain as much as 15.4 billion barrels of oil, or about two-thirds of the entire shale-oil reserves in the United States. And oil and gas executives acknowledge that the controversial practice of hydraulic fracturing will likely play a big role in getting to and recovering all that oil. That’s why critics say they are pressing to pass laws now which would closely monitor and regulate fracking before the oil boom really begins. Fracking techniques have raised health concerns in the eastern United States for year. Critics point to things such as drinking water catching on fire as proof that high levels of fracking chemicals can seep into drinking water supplies and harm communities. Tom Frantz took NBC Bay Area on a tour of the fields around his home to demonstrate what he said was a fracking operation going on in one of his neighbor’s fields. It is a large operation with lots of trucks gathered around a well head. It is an operation that often takes less than a day or so to complete. NBC Bay Area witnessed what appeared to be sand, water and chemicals injected at high pressure into a well head. Fracking documents put out by the Western States Petroleum Association show the mix of water, sand and chemicals is then injected thousands of feet deep underground, where it breaks up the shale formations holding the oil so that it can be recovered. As NBC Bay Area first reported in March 2012, right now California doesn’t directly regulate, monitor or track any of these fracking operations. “I’m very concerned as chair of the water committee for the state senate, particularly on water quality, impacts on groundwater quality and water basins and drinking water,” Senator Pavley said. While California’s Division of Oil, Gas and Geothermal Resources has moved to begin regulating and tracking hydraulic fracturing, Senator Pavley said she wants a law passed to ensure the rules and regulations aren’t watered down later. “We need to know what’s going on,” Frantz said. During a half dozen hearings and debate on her bill Senator Pavley has heard from both environmentalists and oil and gas industry representatives. “We support regulations to require mandatory reporting of all the chemicals used in hydraulic fracturing,” said Tupper Hull, vice president of the Western States Petroleum Association. Hull and Western States Petroleum Association represent 27 different major companies which produce, transport and refine oil and gas in six western states, including California. Hull points out that in during 60 years of fracking in California there have been no identifiable accidents involving the practice. That is due namely to current regulations. Hulls says current state regulation and monitoring of all oil well construction is so stringent in California that fracking can be done safely without further monitoring. Even so, he believes the time has come for new laws to create transparency when it comes to hydraulic fracturing in California. “Frankly, our members recognize that we will be operating… they will be operating under more regulations as we go forward. That’s clear,” Hull said. “We need a new set of rules, sooner rather than later,” Frantz said. Senator Pavley’s bill just made it out of the Assembly Committee on Natural Resources and is headed to the Appropriations Committee in August. Backers said they believe it will likely pass and could be signed into law by Governor Brown as early as this fall.